This is the third and final in a series of posts discussing the evolution of building technology. We covered the major trends driving buildings of the past and the present – now let’s look at what the future holds for building automation and efficiency. When looking to the future of buildings, one thing has become apparent. 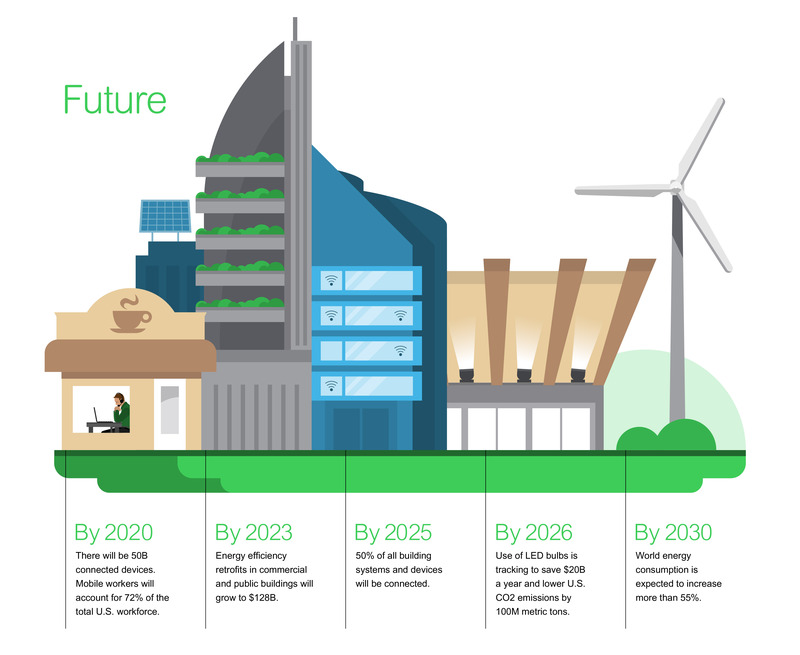 In the coming decades, buildings will become increasingly connected. As of 2014, overall connectivity penetration rates across all buildings systems were only at 16 percent. This rate will rise steadily over the coming years, and mainstream penetration (meaning 50 percent of all building systems and devices will be connected) will likely be achieved by 2025. The Internet of Things (IoT) and connected buildings are beginning to be viewed as a smart business decision. In fact, the IoT market for commercial buildings is expected to grow 25 percent annually to become more than an $85 billion industry in 2020. By 2020 it is expected that there will be 25 billion connected devices. We’re in the midst of a revolution in the way that buildings are run. Occupants want more control over their spaces than ever before and live by the “there’s an app for that” mantra that dominates every aspect of their lives. At the same time, advances in mobile and cloud-based technologies as well as the IoT are creating enormous opportunities for information gathering and sharing and will have an astounding impact on the way buildings are run. As buildings become more dynamic, the possibility to have a greater impact on energy consumption, utility bills and the quality of service to building occupants is very real. The integrated workplace of the future is no longer a pipe dream reserved only for the largest of companies. It can become a reality for organizations in a variety of industries and will prove to be a valuable competitive advantage. Businesses are seeing the value of connectivity as they look toward their financial future. Seventy percent of decision-makers see the business value of IoT, and 63 percent of organizations plan to leverage IoT to better analyze behavior and improve service levels. The next challenge on the horizon is for facility managers and building owners to be able to understand, analyze and use the data from their newly connected buildings. Connected building management systems will serve as the backbone of buildings of the future by churning out useful data that leads to action and drives return on investment. Commercial buildings have come far, fast and are still rapidly evolving. Keeping up with building management requires a solution that can handle the complexity of joining multiple systems and one that is agile enough to scale as more things become more connected. How will you use building technology to bring innovation to every level of your organization?